Brew Hard Cider right from home. The makers of America's most popular homebrew kits, proudly introduce the Mr. Beer Hard Cider Kit! Each fermenter will make 2 gallons of delicious hard cider with each batch, and is completely reusable. It's lightweight and shatter resistant, made from FDA compliant plastic, which imparts no taste or flavor migration. The wide mouth allows for easy cleaning. Archer's Orchard Hard Cider -- This recipe is a bold, crisp hard cider that is great for any occasion! Made by fermenting our apple concentrate, it has a bold taste that’s easy to drink, with a crisp, refreshing edge that’s lighter than beer. Serve ice cold and enjoy. Refreshing, smooth, and delicious! Each refill includes: (2) bottles traditional hard cider concentrate (use both per batch), dry brewing yeast and no-rinse cleanser. NOTE: Alcohol content of a traditional hard cider refill is estimated to be 4.0% ABV. Your actual ABV may vary. Each kit includes eight reusable plastic Polyethylene Terephthalate (PET) bottles, complete with screw caps and labels. These bottles are designed to hold carbonated beverages and are FDA approved to hold food & beverage. BOTTLES DO NOT CONTAIN Bisphenol A. This informative DVD provides step-by-step instructions demonstrating how easy it is to brew, bottle and condition your first batch of tasty beer with the Mr.Beer® Home Brewing System. A useful resource you'll have on hand to refer back to time and again. Self-adhesive labels apply a Mr. Beer label to your bottles. Complete, 4-Step instructions take you through the simple brewing process from start to finish. Mr. Beer mixes are designed specifically to be carbonated in the bottle. Hard cider that carbonate naturally in the bottle tend to have better head retention, clarity and sparkle. With your new Mr. Beer kit, no industrial CO2 cartridges are needed to provide pressure. Place washer on the spigot so that its beveled edge faces the outside keg wall. Place the wide flat side against the inside keg wall and hand tighten. DO NOT USE a wrench or pliers to tighten. FILL THE KEG AND TEST FOR LEAKS. Sanitizing is an essential step in the brewing process because it kills microscopic bacteria and wild yeast that can produce off-flavors in your cider. NOTE: BE SURE TO SANITIZE EVERYTHING THAT WILL COME INTO CONTACT WITH YOUR CIDER. Fill clean keg with lukewarm water to the 4-quart mark on the back. Add ½ pack of the No-Rinse cleanser and stir until dissolved. Once dissolved, the sanitizing solution is ready to use. Screw on lid and swirl so that the solution makes contact with all parts of the keg, including the lid. Allow to sit for 10 minutes. Open and close the spigot several times, dispensing solution onto your bowl in order to make sure all surfaces make contact with the sanitizing solution for 10 minutes. Use the bowl as a resting spot for your clean utensils during the brewing process. When all surfaces have been thoroughly sanitized, drain keg into the sink. Do not rinse or dry. Proceed immediately to the brewing process. See the Care and Cleaning instructions regarding washing your equipment if your keg has previously been used. Brewing cider is the process of combining a source of sugars with yeast. Once combined, the yeast eats the provided sugars, producing alcohol and carbon dioxide (CO2). This process is called fermentation. Bring water to a boil, then remove from heat. Pour the contents of both bottles of concentrate in and stir until thoroughly mixed. This mixture is called must. Pour the must into the keg, then bring the volume of the keg to the 8.5-quart mark by adding more cold water. Stir vigorously with the spoon or whisk. Put your keg in a location with a consistent temperature between 59°and 75° F (15°-24° C) and out of direct sunlight. Ferment for 7-14 days. After approximately 24 hours, you will be able to see the fermentation process happening by shining a flashlight into the keg. You'll see the yeast in action in the must. The liquid will be opaque and milky, you will see rising bubbles in the liquid, and there will be bubbles on the surface. Your fermentation will usually reach its peak in 2 to 5 days (this is also known as “high krausen”). You may see a layer of foam on top of the must, and sediment will accumulate at the bottom of the fermenter. This is totally normal. Complete fermentation will take approximately 1-2 weeks. After high krausen the foam and activity will subside and your batch will appear to be dormant. Your cider is still fermenting. The yeast is still at work slowly finishing the fermentation process. Fermentation is complete, meaning your cider is ready to bottle, when the yeast is no longer active, and the liquid in the keg is clear of the cloudy haze it had while fermenting. You may see rising bubbles in the wort, residual dime sized bubbles on the surface, and should absolutely see a layer of sediment at the bottom of the keg. This typically takes around 7-14 days, and will not ever take any longer than 21 days, given the correct temperature. When you are sure your cider is ready to bottle, fill your clean 1-gallon container with warm water then add the remaining ½ pack of No-Rinse cleanser and stir until dissolved. Once dissolved, it is ready to use. Fill each bottle halfway with the sanitizing solution. Screw on caps and shake bottles vigorously. Allow your bottles to stand for 10 minutes, shake vigorously again to ensure all parts have been touched by the sanitizing solution. Empty your bottles. Do not rinse. Add 2 ½ teaspoons of white granulated sugar to each 1-Liter bottle. Fill each bottle from your keg to just above the base of the neck (about 1 ½ inches from the top). Place caps on bottles, hand tighten, and then gently upend the bottle. Do not shake. Store the bottles upright and out of direct sunlight in a location with a consistent temperature between 59°and 75° F (15°-24° C). Allow to sit for about 14 to 21 days to allow this secondary fermentation, or carbonation stage, to complete. You beer will always taste best if chilled for at least two days before drinking, but long conditioning for 3 months will allow for the finished flavor to really shine. Now pour it into a frosty glass and enjoy! YOU ARE NOW A HOME BREWER! Immediately after use, remove and disassemble the spigot assembly from the keg, then thoroughly wash all parts in warm water using a soft cloth and a clear, basic liquid hand soap or Craftmeister Brewery Wash (available at www.mrbeer.com). Do not use dish soap; it will leave a film that can add unwanted flavor to your next batch of cider.  The MR.BEER® keg, lid, bottles and spigot assembly are not dishwasher safe. Do not use scouring pads, wire brushes, or abrasives during cleaning as they can leave small scratches, which can harbor bacteria that may infect your beer. Be sure to always sanitize all equipment immediately before brewing again.